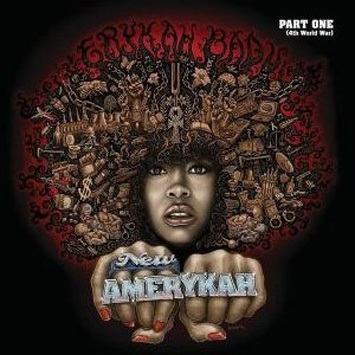 Note : the first in a series of 3 albums this year, with "Return of the Ankh" to be released in July 2008 and "New Amerykah 2" at the end of the year. Universal Motown's multi-platinum-selling, Grammy award-winning singer/songwriter/actress Erykah Badu returns to the music limelight with her debut single "Honey." Laced with Erykah's bluesy grit and MC style vocals, the song is bolstered by producer's 9th Wonder's razor sharp hip hop beats. Badu describes the song as "an old school track with some funk on it." Praise for the single is already rolling in, with tastemaker DJs in NY, Chicago, Dallas and other cities already declaring their love for the innovative song. The release of "Honey" on November 20th also marks Badu's 10th year in the music industry. To celebrate, the gifted trendsetter prepares the release of her much anticipated new album on her birthday, February 26th. Badu has enlisted some of the most talented, groundbreaking underground producers and engineers in the hip-hop game to support her breakthrough return, including Grammy Award winning producer 9th Wonder (Jay-Z, Nas, Mary J. Blige), Madlib, Mike "Chav" Chavarria and R&B singer Bilal. A special, 12-inch pink wax edition will be available only to DJ's next month and will feature album tracks, "The Healer" and "Real Thing." "The music is the star," says Erykah, "I just laid down my vocals and let the music breathe while the melodies tell the stories." Erykah Badu, a Dallas native emerged in 1997 with her masterpiece debut album Baduizm as a primal force of nature connecting old school soul with contemporary R&B. The album garnered her numerous award nominations, pulling 2 coveted Grammys (Best Female R&B Vocal, Best R&B Album) and multiple Top spots on critics' Best-Of-The-Year Lists. In 2000 she followed up with the critically acclaimed platinum selling album, Mama's Gun. In 2003 the EP World Wide Underground was awarded Gold certification. Erykah most recently performed a Diana Ross Tribute on the BET Awards and the hit show Girlfriends and received rave reviews. The highly regarded upcoming project will be Badu's first full length album in 7 years.